This is how I learnt to remember compass directions when I was little…North (Never), East (Enter), South (Smelly), West (Washrooms) in clockwise direction. Little did I know that this would ever come in handy when I try to decipher surf reports. Welcome to the world of swell and wind directions – the second part of the surf report crash course (see here for part 1 about surf size in case you missed it). That’s 5 or so mentions of compass directions in the first two sentences. Ok, I shall attempt a translation for you. E(ast) or N(orth) facing means that the beach is open to the East or North. Bondi is a South facing beach. Maroubra, Tama and Bronte are facing East. So if you are not sure which direction the beach you are at is facing, just check out Google maps where you can see which direction the beach is open to. If you read things like East swell, North swell or South swell that denotes the direction the waves are coming from (how they are formed and why they are coming from another direction is a different story). Depending on which direction your beach is facing, the swell direction can be good or bad i.e. mean waves or no waves. 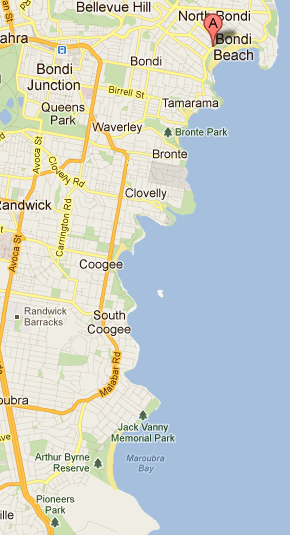 Ever wondered why Bondi is flat sometimes, while Maroubra is pumping? Well, Bondi as a South facing beach misses any swell from the East. Having said that, if it’s a massive East swell and all the East facing beaches are unsurfable, Bondi might be the pick. Because if it’s a big enough swell, it will literally wrap around the corner and you’ll get a smaller size version of the big stuff. Same goes for winter, when we tend to get big South swells. Bondi can’t handle big South swells. The waves are likely to be ball and board breakers… South swells hit Bondi with full force as a South facing beach (see glorious drawings below). You are better off to check out neighboring beaches or head North to protected beaches that don’t get hit straight. So in short, if the swell direction = same direction as your beach is facing = there will be waves on your beach. With the wind it’s a different story. If the wind is coming from the same direction like your beach is facing = not great. That means that it’s onshore. That’s when you get the mushy conditions. You can usually tell by not even looking at the wind direction though. The air tends to smell salty and humid (as the wind carries the salty water on shore…). If the wind comes from the opposite direction, it means it’s offshore which is good for your surf conditions. E.g. 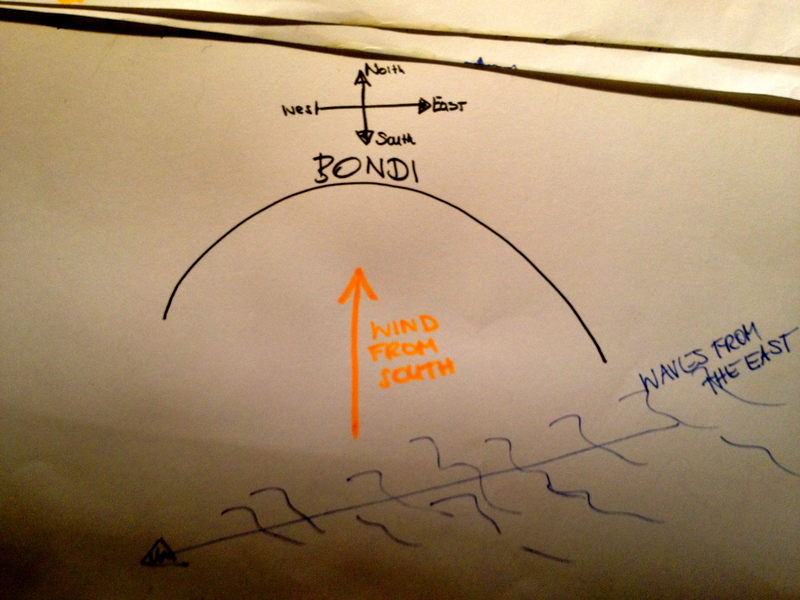 Southerly wind is not great for Bondi as a South facing beach, whereas wind from the North makes for nice conditions. Best is no wind that’s when you get the glassy effect. Sorry but that’s only the super basics, there are hundreds of swell and wind combinations and angles that make or break the surf conditions on a certain beach. Local knowledge is the key (no worries, you’ll get there after a few years..). If this is doing you head in: Sometimes it helps drawing it up (in your mind or on paper). See below that’s my example of how the surf conditions in the surf report above is affecting Bondi: ENE swell in blue and Southerly wind in orange… See how the waves go straight past Bondi and the wind right into it. Worst conditions for Bondi really. Or you can try to follow me on Twitter @rangsies for gidget friendly reports from Bondi most mornings.